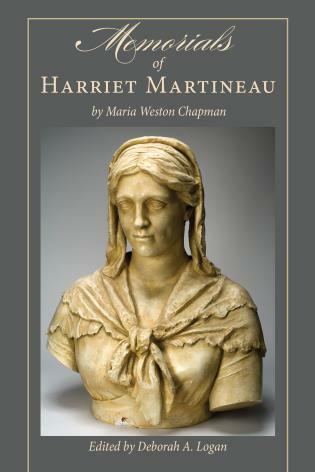 Memorials of Harriet Martineau by Maria Weston Chapman was published in 1877 as volume three of Harriet Martineau’s Autobiography. While the triple-decker was a popular format of the era, the configuration of a two-volume autobiography authored by one and a one-volume biography written by another is unusual. Indeed, the work’s publishing history reveals that, in reissues of the Autobiography, the Memorials volume was not reproduced; while some might claim that the problem is with the editor—American abolitionist Chapman—rather than the contents, the fact remains that the bulk of the volume consists of primary materials written by Martineau that are available nowhere else, published or archival. Chapman’s participation in the project was originally conceived as supplemental, in the event that the ailing Martineau did not live long enough to complete her memoirs; as it happened, Martineau—who finished the two volumes and had them privately printed in 1855—lived another twenty-one years. Whereas the Autobiography records what Martineau called the “interior life” or subjective perspective on her career, Chapman’s volume addressed the exterior by offering a biographical overview of her friend’s life and work, a record of her last decades, and a collection of posthumous memorials by those with whom her private and public lives intersected. Chapman’s role was to “take up the parallel thread of her exterior life,—to gather up and co-ordinate from the materials placed in my hands the illustrative facts and fragments by her omitted or forgotten; and to show . . . what no mind can see for itself,—the effect of its own personality on the world.” This volume is the first scholarly edition of the Memorials—a biography of one of the foremost intellectual women of the nineteenth century, told primarily in her own words.